I've been there, done that. And each time I've done that, I get mad at myself. I feel so silly for comparing my body to Jennifer Aniston's body. I mean, come on. The woman is beautiful, 45 years old and has an amazing body. She obviously makes the effort to workout and eat right or she wouldn't look like that. Does it kill me that she has a better body than me at 45 years of age? (I'm almost 32). Of course it does! But here's why I'm done comparing myself to celebrities and why you should too. Because you know you've had those thoughts at some point in your life. Let's not kid ourselves. I chose Jen simply because I love her as an actress and her body is pretty smoking. This is just my opinion. -she didn't give birth (I say this for the simple fact that her body hasn't drastically changed; which is what happens once you become pregnant). But overtime, her body has obviously changed. Now, I'm not trying to bash Jen in any way. She is one of my favorite actresses. And the above is a little bit factual for what I think are obvious reasons, but again, it's just my opinion. But those are the main reasons why I've stopped comparing my body to hers and other celebrities. And if you've been doing the same thing I've done, those are the reasons you should stop. Stop because comparing yourself to others is a waste of time. Stop because you could be putting that energy into anything else but that. Stop because you sound stupid and annoying to others. I told you that I've been there, done that, right? Stop because of those reasons above. That should go for pretty much ALL the celebrities. Unless they are a male, then just ignore the kid/giving birth scenario. Love yourself. Love your body. Give yourself some credit when you know you're putting in effort to make a positive change for yourself. Cut yourself some slack, too. Cookies and pizza are delicious; and sometimes necessary. I wanted to write this post to not only share with others, but for myself too. I gave birth four months ago and it was the craziest, most amazing experience of my life. Ever. 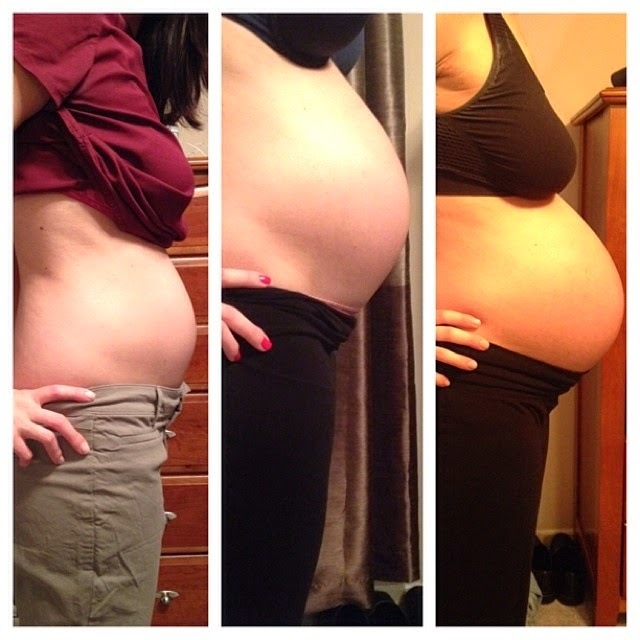 Pregnancy is an incredible journey by itself. You have to embrace it even though while going through it, that's much easier said than done. But once that baby comes, another incredible journey begins. I like to say it's a vicious cycle, but it's much better than laundry. Me: 21 weeks. 32 weeks. and 36 weeks pregnant. The aftermath of a woman's body after being pregnant and giving birth is pretty incredible. It all just takes time. You have to heal, you have to rest, you have to just take one day at a time. I don't want to rush into getting my pre-baby body back. I'm just doing my best each day and going with the flow. I'm making the choice to eat an apple instead of a bagel now. I'm choosing to go for a run instead of taking a nap certain days. I also am choosing to play with my daughter instead of going to the gym. And I also choose to eat a brownie for dessert, on the couch, while relaxing and watching TV. It. All. Takes. Time. Stop comparing and start living. You'll be much happier. I promise. *Please Note* I just mention the whole pregnancy thing because it's through my experience when it now comes to body image. Obviously, you wouldn't have to of given birth to only compare yourself to famous people's bodies. You can just be a normal average Joe who wishes they had Cameron Diaz' abs. But stop now if you're doing that, please. Love this post! Couldn't agree more with you and will definitely focus on that once I get pregnant! Great blog Dana. All so true. You look great and such a good mommy! Love Mom. Great post Dana and so true! Comparison is the thief of Joy!